Patrick M. Gallagher has spent virtually his entire career at the Department of Commerce’s National Institute of Standards and Technology (NIST), which is best known for setting America’s clock by providing the nation’s standard time service. 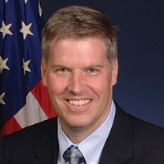 Gallagher has been the de facto head of NIST since the last year of the Bush administration while serving as deputy director, but was officially sworn in as director on November 20, 2009. Gallagher’s father, John, worked at the Sandia National Laboratories in New Mexico, and Pat was raised in Albuquerque. He graduated from Saint Pius High School and spent summers working on public health and sanitation projects in Ecuador, Honduras, and Mexico with the group Amigos de las Américas. Gallagher earned his bachelor’s degree in 1985 at Benedictine College in Atchison, Kansas, majoring in physics and philosophy. After teaching high school math and science for a year in St. Joseph, Missouri, he returned to university, earing a Ph.D in physics at the University of Pittsburgh in 1991. He spent two years doing post-doctoral research at Boston University, and then joined NIST as an instrument scientist for the Center for Neutron Research (NCNR) at the NIST Gaithersburg campus in Maryland. The NCNR focuses on providing neutron measurement capabilities for researchers. Gallagher concentrated on research on neutron and X-ray instrumentation and soft condensed matter systems, such as liquids, polymers and gels. Gallagher gradually worked his way up at NIST, serving as the agency’s representative at the National Science and Technology Council from 1999-2000. He also chaired the Interagency Working Group on neutron and light source facilities in the Office of Science and Technology Policy. In 2004, Gallagher became director of the NCNR. In 2008, Commerce Secretary Carlos Guttierrez selected Gallagher to be deputy director of NIST. With the director’s position vacant, he ran the agency, overseeing a budget of $1.6 billion and a staff of 2,900 scientists, engineers, technicians, and administrative personnel. Gallagher has been a member of numerous advisory, study and review committees including the Math and Physical Sciences Advisory Committee of the National Science Foundation; the Committee of Visitors for Basic Energy Science in the Department of Energy for the Division of Materials Science and Engineering and the Division of Scientific User Facilities; the Solid State Sciences Committee, the Neutrino Advisory Committee and the New Materials Growth and Synthesis Committee of the Board on Physics and Astronomy of the National Research Council; the Neutron Sciences Advisory Board of Oak Ridge National Laboratory; and the Scientific Advisory Board of the Advanced Photon Source for Argonne National Laboratory. Gallagher and his wife, Karen, have three sons.